There are many tutorials on the making of it but some can be confusing. And so I have tried to keep them as easy to follow as I can and a video is one of the best ways to do it. 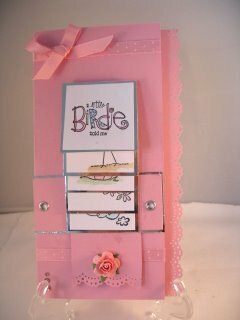 There are many cards on the website with the "Wow" factor and most of them are easy to do. This short video Tutorial will show you how to get the best results from this technique without getting lost. Choose your pretty papers and some card and watch the video then try it for your self. If you prefer to read then you will find the Written Instructions here. This is also one of those cards that will delight children so make sure you make it strong enough to withstand all the pulling it will have to take when they play with it. Before you attach this to the card you need to know which way round you wish the card to be before you stamp the image. The photographs show you the two options available. Then when you add the images they will all be in the correct position to be seen. You will need a strong double sided tape or a wet glue, and a wet glue is by far the strongest ...especially if it is going to be given to a child who will want to play with it. 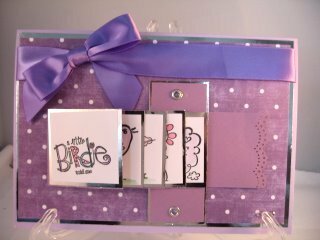 The video is short and easy to follow and I hope you will give this Waterfall Card Tutorial your time ... it will be worth it, and it is one you will be proud to give for any occasion.